Home Master TMAFC Artesian Full Contact Undersink Reverse Osmosis Water Filter System. Purified pH Balanced Water – restores natural calcium and magnesium minerals (ions) removed during the reverse osmosis process to produce clean, pure pH Balanced Mineral Water on Tap. Included Fast Flow RO! Kit – Double the flow from your faucet fills your cup twice as fast as standard RO systems, without the need for larger, more costly membranes that do not produce results from the faucet where it counts. Smooth, delicious mineral water quality with greater convenience, lower price and reduced carbon footprint when compared with buying bottled mineral water. 100% total satisfaction guaranty for 30 days or your money back; 5 year limited warranty. The Home Master Artesian -- Full Contact Reverse Osmosis System produces Alkaline Mineral Water on Tap by first stripping the water clean, removing 98% of contaminants using the reverse osmosis (RO) process, then channeling the water through the advanced remineralization filter twice using our patented Full Contact Technology to rejuvenate and restore 30-60 mg/L calcium and magnesium minerals. Its an entirely natural process - just like rainwater passing through the earth. This Full Contact technology creates the best drinking water, coffee and tea you will ever have. Guaranteed or your money back. The "steady" water flow from a typical home RO system will take about 40 seconds to fill a pitcher or large spaghetti pot. This level of performance was unacceptable to our team of engineers, so we devised a Fast Flow RO!™ kit for the Home Master Reverse Osmosis Systems which effectively doubles the water flow from your RO faucet! We never stop searching for new ways to satisfy. One thing you will notice about the Home Master RO system is that our filters are incorporated into the filter housing, so that when it comes time for the annual filter change, the filter, and the entire filter housing, are disposed of. This is to prevent flooding in your home. The leading competitors “canister” type RO system keeps the same filter housing year after year, subjecting it to constant high water pressure, water erosion, and wear from maintenance. Only the filter element is changed. After about 5 years the walls and seals of the competitors canister filter housing begin to weaken and decay, eventually failing, potentially causing substantial damage. The second thing you should notice about the Home Master RO system is the high grade filters designed to yield 3900 gallons of purified water, with both carbon stages made from coconut shell catalytic carbon, and filtration down to 5-microns. The competition typically uses lower grade filters made from coal carbon rated to purify just 1500 gallons of water, with one 5-micron filter and one 10-micron filter. The competition also uses unnecessary extra filter stages and recommends multiple filter changes per year in order to compensate for their poor quality filters. All Home Master RO systems now use powerful catalytic carbon filtration media in the carbon pre-filter to treat the very persistent chemical disinfectant chloramine. Ordinary carbon filters are unable to effectively remove this stubborn contaminant that is now being deployed nationwide to replace chlorine. It takes the more advanced carbon media known as catalytic carbon. In designing the Home Master a sophisticated combination of flow restriction components were integrated into the system architecture to regulate pressure to and from the 50 gallon per day membrane chamber for optimized water purification and minimized waste water production. The most sophisticated components certified to NSF standards are included in the design and construction of our products. For further system efficiency improvement please consider a Permeate Pump which will reduce waste water, increase water production, and provide slightly cleaner water by eliminating the condition known as "TDS creep." The Home Master Reverse Osmosis drinking water purification system is a premium product designed to convert your tap water into pure, delicious drinking water. 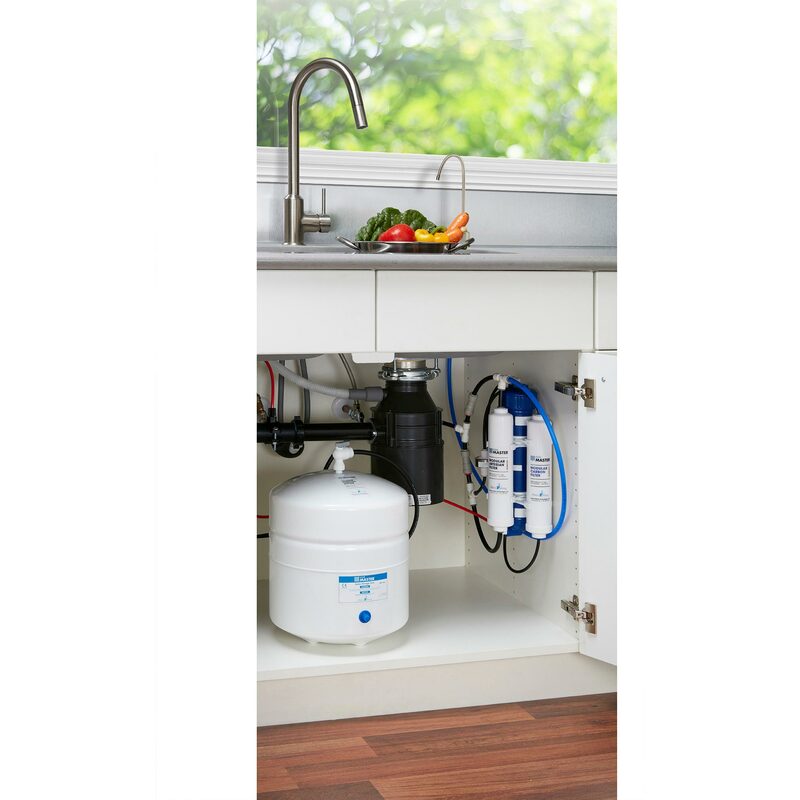 The advanced Filmtec brand membrane used in the Home Master RO can safely eliminate up to 98% of dissolved solids, metals, and harmful chemicals from your tap water. BPA Free. For more information see our FAQ Page. Instruction book: detailed descriptions including color photos and troubleshooting guide. Assembled purification unit with filters and membrane. Flow restriction architecture: integrated flow restrictor and water check valve, central auto shut-off valve; all fittings and connection hardware. Drain saddle all fittings and connecting hardware. Reserve tank: 3.2-gallon capacity, mounting stand, ball valve, quick connect fittings and hardware. 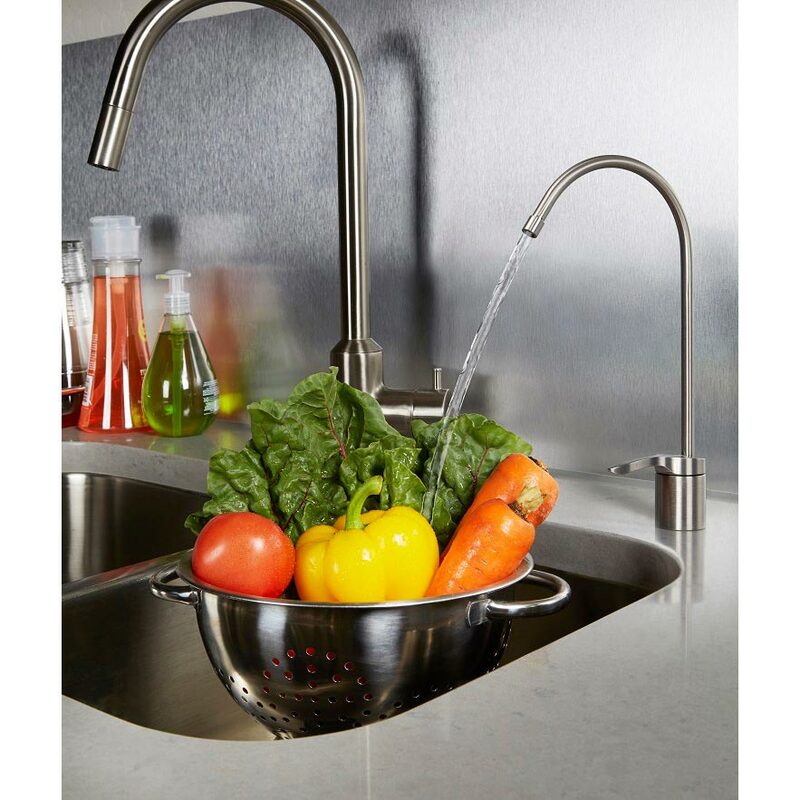 Lead free chrome long reach sink faucet: quick connect fittings and hardware. * Your results may vary depending on regular maintenance, general condition of unit, and initial water supply. 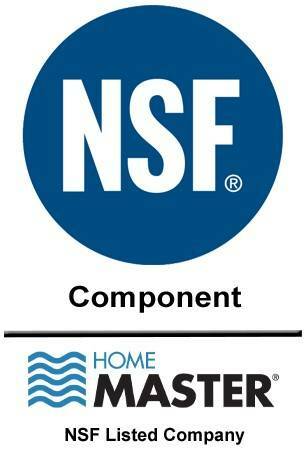 Home Master RO is not designed to treat microbially unsafe or non-potable water. The Home Master Artesian Full Contact is not designed to treat iron rich water. Fast Flow RO! kit - Double the water flow rate from the RO sink spigot! Other RO systems high flow kits only refill the reserve tank more quickly, they don't actually improve the flow from your sink spigot. Only the Fast Flow RO"! kit from Perfect Water Technologies will fill your cup or large container in a hurry. Upgraded Home Master Reverse Osmosis Systems come fully assembled, ready for installation.